Your Blu-ray player could also play contents from your home network. But it only has one RJ45 port and you do not wish to have a network cable across the room. Netgear has a solution for your problem. The WNCE2001 is a WLAN bridge that lets every networkcompatible device (with an RJ45 port) transmit wirelessly. Whether it is a Nintendo Wii, Xbox 360 or your new Blu-ray player, you can use it to access the resources of your home network and the Internet without a cable mess. The best part is that the Netgear bridge can also cover your power requirements using a USB connection. 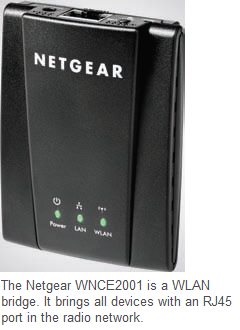 The bridge supports 802.11 N Wireless LAN and all the latest encryption procedures up to WPA2. The device weighs in at about 50 g and is approximately as large as a cigarette pack. A possible application of the bridge can also be to view content on a network-compatible TV. The power of the small box comfortably suffices for HD video at 1080p.